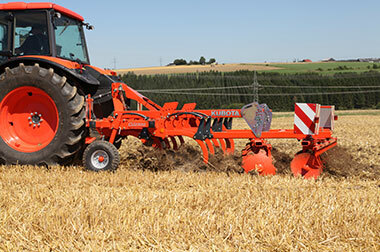 The 2-bar generation of the Kubota cultivators is for tractors from 65hp up to 300hp. The full range of accessories is available to optimise incorporation and leveling. 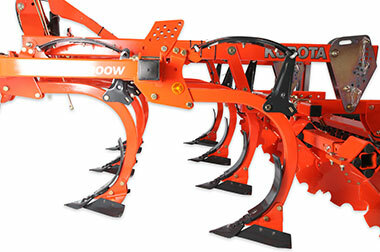 The CU2000 is extremely versatile from shallow cultivation of 7cm down to loosening at 40cm depth. Available from 2.5m up to 4.0m, the tines are providing the best crumbling by creating smaller aggregates, encouraging an easy incorporation of the residues with the disc gangs behind. 870mm under-beam clearance and 280mm average tine spacing for blockage-free operation. Breaks up soil compaction and plough pans to depths of 40cm. Tine designed to guarantee penetration even in extreme conditions. Flexible maintenance-free tines, providing high vibration through the ground for cracking and crumbling. 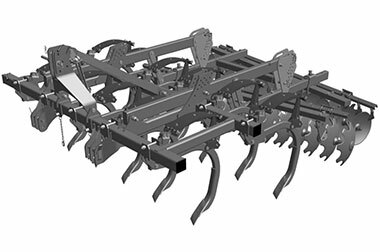 2-bar frame compact cultivator to match with low tractor power. Intermediate tine spacing of 420 or 370mm (fold). The heat treatment is of the same standards as the beams on the Kubota ploughs. For lighter conditions, Kubota offer the “C” tine with shearbolt overload protection releasing from 2 tons. The Kubota “C” tine equipped with the “Auto-reset” leaf spring safety system is the perfect choice for hard and stony conditions. The tine leg can withstand sideway movements of up to 14cm for the CU3000 Series, and to 20cm for the CU2000 Series. This means lower stress to the tine holder and frame structure. The “C”-tine system is maintenance-free. The “C”-tine: with the standard reversible plough point made of high quality steel for maximum service life. This allows to work at great depths even in stony soil – eliminating plough pans and in this way encouraging natural drainage. For stubble cultivation the “C” tine can be equipped with 30cm wing shares. New Quantum share 345mm – always in combination with Knock-on® or Tiger carbide point 80mm. It has been designed for use especially in hard soil. The 80mm point combined with the 345mm wing share ensures perfect penetration and complete flat cutting for a homogeneous weed regrowth. 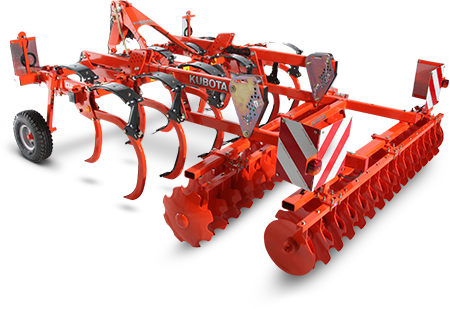 For lighter conditions Kubota offer the CLC tine with shearbolt overload protection. The Kubota tine equipped with the “Auto-reset“ leaf spring safety system is the perfect choice for hard and stony conditions. 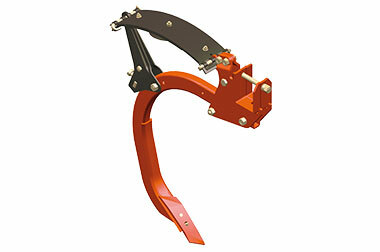 The well renowned Kubota leaf spring protects the tines against overload. The tine starts to release with loads over 640 kg. The release force decreases with the release height to protect the frame against high stress. All pivot points of the CLC tines are manufactured with wear resistant bushes and bolts of the renowned Kubota quality.